In May 2017, this started out as a demonstration that Scanpy would allow to reproduce most of Seurat’s (Satija et al., 2015) guided clustering tutorial. We gratefully acknowledge the authors of Seurat for the tutorial. In the meanwhile, we have added and removed a few pieces. Download the notebook by clicking on the Edit on GitHub button. On GitHub, you can download using the Raw button via right-click and Save Link As. Alternatively, download the whole scanpy-tutorial repository. In Jupyter notebooks and lab, you can see the documentation for a python function by hitting SHIFT + TAB. Hit it twice to expand the view. Show those genes that yield the highest fraction of counts in each single cells, across all cells. Let us assemple some information about mitochondrial genes, which are important for quality control. High proportions are indicative of poor-quality cells (Islam et al. 2014; Ilicic et al. 2016), possibly because of loss of cytoplasmic RNA from perforated cells. The reasoning is that mitochondria are larger than individual transcript molecules and less likely to escape through tears in the cell membrane. Note you can also use the function pp.calculate_qc_metrics to compute the fraction of mitochondrial genes and additional measures. A violin plot of the computed quality measures. Remove cells that have too many mitochondrial genes expressed or too many total counts. Total-count normalize (library-size correct) the data matrix to 10,000 reads per cell, so that counts become comparable among cells. Set the .raw attribute of AnnData object to the logarithmized raw gene expression for later use in differential testing and visualizations of gene expression. This simply freezes the state of the AnnData object. While many people consider the normalized data matrix as the “relevant data” for visualization and differential testing, some would prefer to store the unnormalized data. Regress out effects of total counts per cell and the percentage of mitochondrial genes expressed. Scale the data to unit variance. Scale each gene to unit variance. Clip values exceeding standard deviation 10. Reduce the dimensionality of the data by running principal component analysis (PCA), which reveals the main axes of variation and denoises the data. We can make a scatter plot in the PCA coordinates, but we will not use that later on. Let us inspect the contribution of single PCs to the total variance in the data. This gives us information about how many PCs we should consider in order to compute the neighborhood relations of cells, e.g. used in the clustering function sc.tl.louvain() or tSNE sc.tl.tsne(). In our experience, often, a rough estimate of the number of PCs does fine. Let us compute the neighborhood graph of cells using the PCA representation of the data matrix. You might simply use default values here. For the sake of reproducing Seurat’s results, let’s take the following values. As we set the .raw attribute of adata, the previous plots showed the “raw” (normalized, logarithmized, but uncorrected) gene expression. 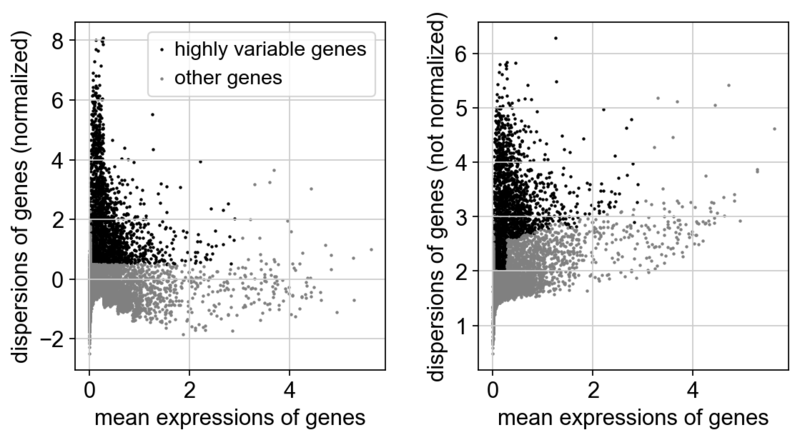 You can also plot the scaled and corrected gene expression by explicitly stating that you don’t want to use .raw. As Seurat and many others, we recommend the Louvain graph-clustering method (community detection based on optimizing modularity). It has been proposed for single-cell data by Levine et al. (2015). Note that Louvain clustering directly clusters the neighborhood graph of cells, which we already computed in the previous section. Plot the clusters, which agree quite well with the result of Seurat. Let us compute a ranking for the highly differential genes in each cluster. For this, by default, the .raw attribute of AnnData is used in case it has been initialized before. The simplest and fastest method to do so is the t-test. 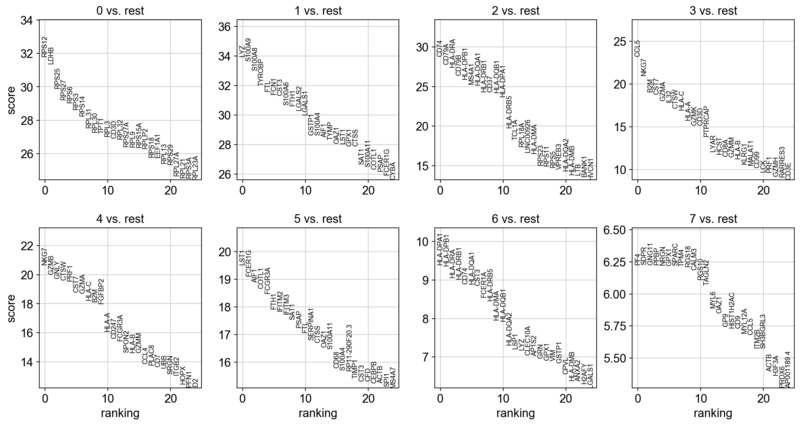 The result of a Wilcoxon rank-sum (Mann-Whitney-U) test is very similar. We recommend using the latter in publications, see e.g., Sonison & Robinson (2018). You might also consider much more powerful differential testing packages like MAST, limma, DESeq2 and, for python, the recent diffxpy. As an alternative, let us rank genes using logistic regression. For instance, this has been suggested by Natranos et al. (2018). The essential difference is that here, we use a multi-variate appraoch whereas conventional differential tests are uni-variate. Clark et al. (2014) has more details. With the exceptions of IL7R, which is only found by the t-test and FCER1A, which is only found by the other two appraoches, all marker genes are recovered in all approaches. Let us also define a list of marker genes for later reference. Reload the object that has been save with the Wilcoxon Rank-Sum test result. Show the 10 top ranked genes per cluster 0, 1, …, 7 in a dataframe. Get a table with the scores and groups. Compare to a single cluster. If we want a more detailed view for a certain group, use sc.pl.rank_genes_groups_violin. Reload the object that computed differential expression by comparing to the rest of the groups. If you want to compare a certain gene across groups, use the following. Actually mark the cell types. Now that we annotated the cell types, let us visualize the marker genes. There is also a very compact violin plot. During the course of this analysis, the AnnData accumlated the following annotations. Get a rough overview of the file using h5ls, which has many options - for more details see here. The file format might still be subject to further optimization in the future. All reading functions will remain backwards-compatible, though. If you want to share this file with people who merely want to use it for visualization, a simple way to reduce the file size is by removing the dense scaled and corrected data matrix. The file still contains the raw data used in the visualizations. # Or export everything except the data using `.write_csvs`. # Set `skip_data=False` if you also want to export the data.